Out and about. Three words that sum up last week for President Muhammadu Buhari. From Benue State to Yobe and then to Niger State, the President had an eventful week marked with few controversies which is capture in the summary of his daily activities below. The new week greeted Nigerians with an upward review of the prices of alcoholic beverages and tobacco. The Minister of Finance, Mrs Kemi Adeosun announced in Abuja that the President has approved an amendment of the excise duty rates for the products. The new excise duty regime takes effect from Monday, June 4, 2018, after a grace period of 90 days to all the manufacturers. As the news of incessant killings by suspected herdsmen spread on, the Senior Special Assistant to the President on Media and Publicity in an interview handed a note of warning to critics of Buhari administration. Defending his boss, Garba Shehu on Channels Television programme, Sunday Politics said Buhari is committed to ridding the country of terror but never promised that Nigeria would be 100 percent crime free. Still in the clime of the nation’s security, the legislative arm of Buhari’s administration was also in the news on Sunday. The Deputy President of the Senate, Senator Ike Ekweremadu allayed fears of a possible takeover of the nation by the military. He decried alleged twist and misconstruction of his comments on the floor of the Senate by ‘some persons’ and warned politicians against previous mistakes which gave room for military overthrow. Nigerians had a reason to smile as a son of the soil made the nation proud on the international stage. Imo State-born Chile Eboe-Osuji was on Sunday elected President of the International Criminal Court (ICC). This news got the attention of the Presidency and Minister of Foreign Affairs Minister who excitedly took to their official Twitter handle to congratulate Eboe-Osuji. Salaries of Nigerian Senators again came under review. This time around Senate spokesman, Senator Aliyu Abdullahi took a swipe at ‘whistleblowing’ Senator Shehu Sani. He said the humongous figures released by Senator Sani are not secret. He revealed that any Nigerian interested in how much Senators earn has access to the figures as they are contained in various line items and expenditure heads of the budget of the National Assembly which has been made public. Taking the bull by the horn, Buhari commenced his out and about on Monday. He landed the airport at Makurdi, the Benue state capital at 10:43 a.m. marking his first visit to the state since the New Year killings which claimed the lives of over 70 people. With the aim of dousing tension and to find a lasting tension to the incessant killings, the President held a stakeholder’s meeting with various groups in the food basket of the nation. The stakeholders including the farmers and Miyetti Allah Leaders seized the August visit of the President to air their grievance. Buhari’s Benue visit took a shocking turn when he told Benue stakeholders that he is not aware that the Inspector General of Police (IGP), Ibrahim Idris, left Benue for Nasarawa State after he was ordered to relocate to the state. This attitude of the Police Boss towards a Presidential order has raised specks of dust left unsettling over this week in review. The President ended his address in Benue on that day, begging leaders of various groups in the state to convince their constituents that the Federal Government is not resting on its oars but doing its best to end the recurring attacks. Hosting the President, Benue State Governor Samuel Ortom also begged the Federal Government to upgrade Exercise Cat Race to a full military operation. Despite the military presence in Benue, more killings were still witnessed as a result of the crisis. Some arrests were however made. Buhari did not spend the night in Benue as he had to return to the presidential villa to receive U.S. Secretary of State, Mr Rex Tillerson where he briefed on why Nigeria chose negotiation rather than the military option to secure the release of the Boko Haram abducted Dapchi schoolgirls and the remaining Chibok girls. To settle some of the specks of dust raised during Buhari’s Benue visit, his Special Adviser on Media and Publicity, Mr Femi Adesina, on Tuesday featured as a guest on Channels Television’s Breakfast programme, Sunrise Daily. He said, during the programme, that Buhari is a leader who gives no room for incompetence. Contrary to some reports that the President was slow to action, his aide explained that he seeks justice diligently and doesn’t allow innocent people be sacrificed unjustly. Hence his promise to interrogate the IGP on why he defied Presidential order before appropriate action can be taken. Nigerian farmers and rice dealers received hope on Tuesday. Their hope was raised by the President who promised to ensure that quality Nigerian rice is sold at an affordable price in the country. He made this promise when he received a delegation of Rice Processors Association of Nigeria at the Presidential Villa. The Senate House of Assembly was also in the news on Tuesday. At the legislative proceeding, the lawmakers decided to reverse its earlier decision and make concessions to screen for confirmation nominees for the position of Deputy Governor of CBN and members of the Monetary Policy Committee of the CBN. President Buhari in a turn of event which some political experts have earlier predicted wrote a letter to the National Assembly. In this letter, the President told the lawmakers that he is declining assent to the amendment of the 2010 Electoral Act. He said this decision was necessary because the constitution guarantees discretion of INEC to organise, undertake and supervise all elections in the country. He also held a closed-door meeting with the Inspector-General of Police, Ibrahim Idris who he summoned due to his reported flouting of the Presidential order. 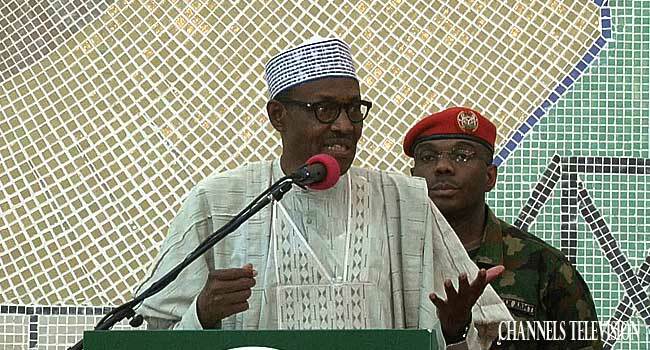 Buhari on Tuesday also surprised critics that tag him ‘baba-go-slow’. He sacked the Coordinator of the Presidential Amnesty Programme for former Niger Delta militants, Brigadier-General Paul Boroh (Retd). In a statement by his special adviser on media and publicity, the President also ordered an investigation into the activities of the programme under Boroh. Buhari’s administration came under a heavy knock by the main opposing political party on Tuesday. The Peoples Democratic Party (PDP) in a statement signed by its spokesman, Kola Ologbondiyan described his administration as incompetent, disorganised and uncoordinated. He only turned deaf ears to the critics as he expressed satisfaction with the growing role of agriculture as a strategy for job creation among Nigerian youths. He said this when he received the Foreign Minister of Tunisia, Boukekri Rmilli, at the State House in Abuja. Buhari said his administration will increase its support for agriculture as a mechanism for jobs creation. The world was however taken aback on Tuesday by the shocking news of the sack of US Secretary of State, Rex Tillerson by President Donald Trump. Trump, using his official Twitter handle announced Director of CIA, Mike Pompeo as the immediate successor for Tillerson. 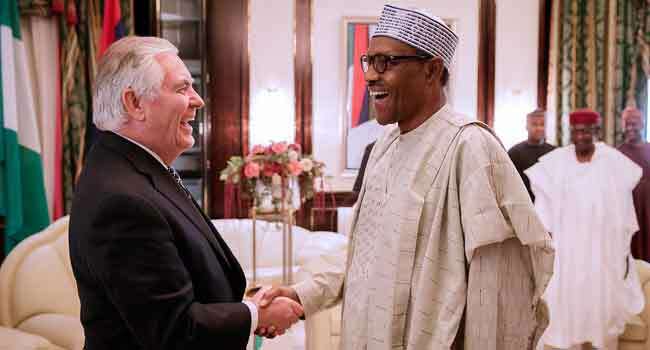 The news threw Nigerians into an amazement with many wondering if Tillerson’s sack is related to his visit to Nigeria. Buhari’s administration on Wednesday woke up to the noise of protesters at the entrance of the presidential villa. 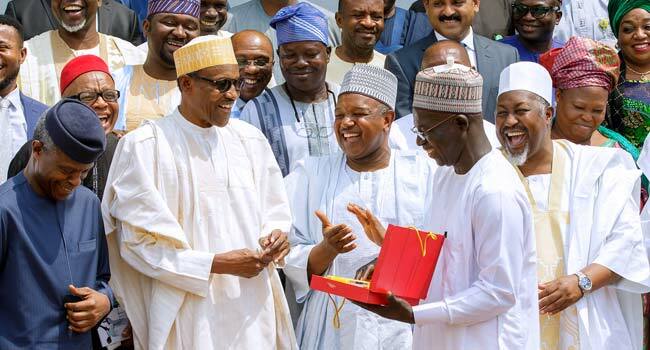 The group which comprises Nigerian youths asked Buhari to make history and assent the Not Too Young To Run Bill when it is finally presented to him. 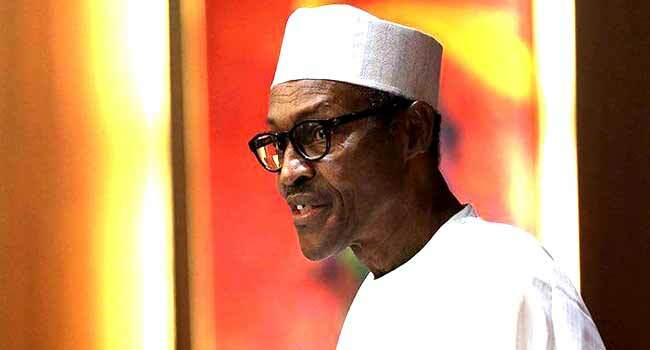 The President, however, was away in Yobe State in continuation of his visit to states troubled by incessant killings. 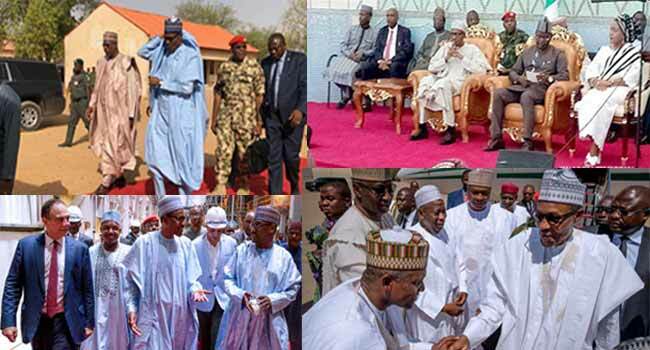 Buhari in Yobe met with parents and teachers of the missing Dapchi schoolgirls where he boasted about the reaction of his administration to the news of the missing schoolgirls. Buhari took a swipe at the previous Goodluck Jonathan-led administration saying his administration’s response to the abduction of the Dapchi schoolgirl’s rates better than the reaction of the Goodluck Jonathan administration to the abduction of the Chibok girls in 2014. 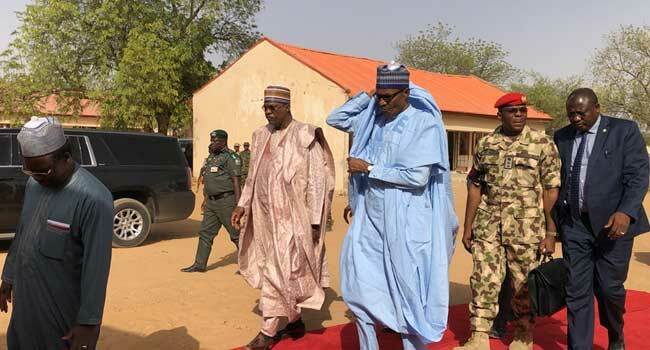 In his usual ‘promisory’ ways, Buhari in Yobe vowed that the Government will not rest until all the Chibok and Dapchi schoolgirls in the Boko Haram custody are released and reunited with their families. The Federal Executive Council (FEC) on Wednesday gave the approval for Nigeria to sign the framework agreement for the establishment of African Continental Free Trade Area (AfCFTA), even as UN ranked Nigeria as the fifth-happiest nation in Africa and 91st globally in the 2018 United Nations World Happiness Report. Wednesday also witnessed a Federal High Court’s decision which barred the National Assembly from taking further action or proceeding with the Electoral Act Amendment Bill. 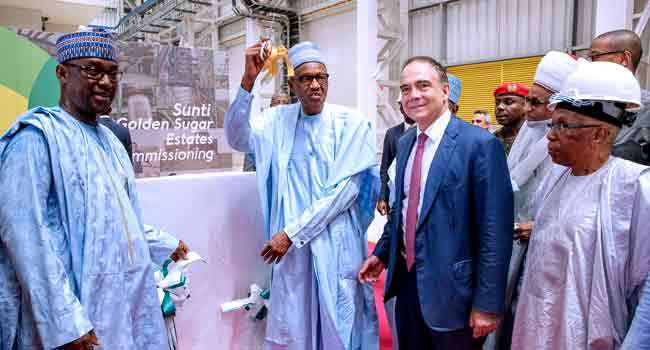 Undaunted by the criticisms, Buhari on Thursday continued his out and about and travelled to Niger State where he inaugurated a N50billion Sugar Estates. He also seized the visit to boast about the policies of his administration. He prided his administration’s effort towards improving Nigeria’s economy through diversification saying it is on the right path. 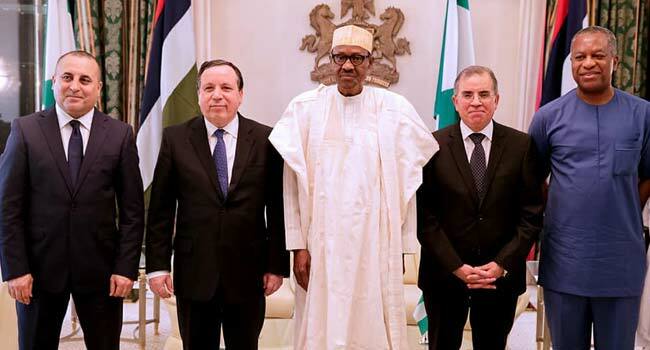 Buhari on Thursday returned to the Presidential Villa in Abuja. In the evening, she met behind closed doors with the leadership of the National Assembly. At the end of the meeting, Secretary to the Government of the Federation, Mr Boss Mustapha disclosed that Buhari has directed all ministers and parastatals to appear before the National Assembly to defend their budgets. While Buhari goes out and about, Vice President Yemi Osinbajo was giving out his daughter’s hand in marriage. 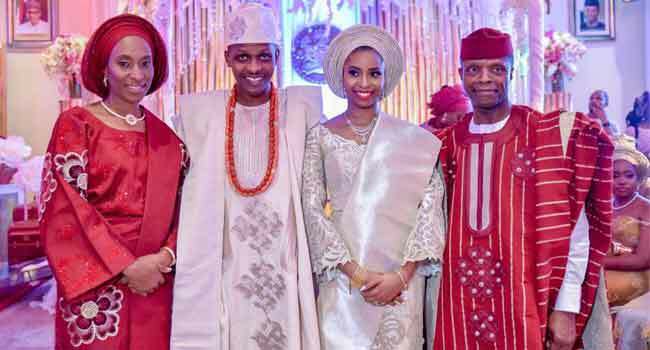 The presidential villa was filled with sounds from drum beats and happy guests as the Vice President’s eldest daughter Damilola engages in a colourful traditional engagement to her heartthrob, Oluseun Bakare. Nobel Laurete, Wole Soyinka, however refused to dance to the drumbeat from the presidential villa. Instead, the Lion and Jewel author offered a piece of advice to Buhari. Amidst the killings and incessant attacks by suspected herdsmen, Soyinka challenged Buhari to declare herdsmen as terrorists. This is after Soyinka had earlier claimed that the President appears to be in a trance due to the way he is running affairs of the nation. Away from the melodious music of the Vice President’s Daughter’s traditional engagement, the President started Friday in a mournful mood as he expressed condolences to the people of Kaduna State and the Christian community over the passing away of the Bishop of Kafanchan Catholic Diocese, Most Rev. Joseph Danlami Bagobiri. He later approved establishment of National Food Security Council. This approval comes days after he earlier announced the intention of the Federal Government to establish a National Food Security Council. His Senior Special Adviser on Media and Publicity, Garba Shehu said the Council which will be chaired by the President, will be inaugurated on Monday and have the governors of Kebbi, Taraba, Plateau, Lagos, Ebonyi and Delta states as members. 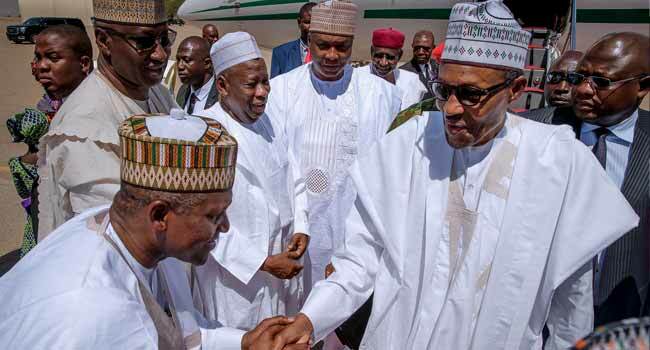 The President had reasons to rejoice on Friday as he joined business mogul, Aliko Dangote, who gave out the hand of his daughter, Fatima in marriage to Jamil, son of former Inspector-General of police, Mohammed Abubakar.